While retail physical silver investment demand experienced a pronounced decline this year, the volume is still much larger than the level prior to the 2008 U.S. Housing and Banking Crash. 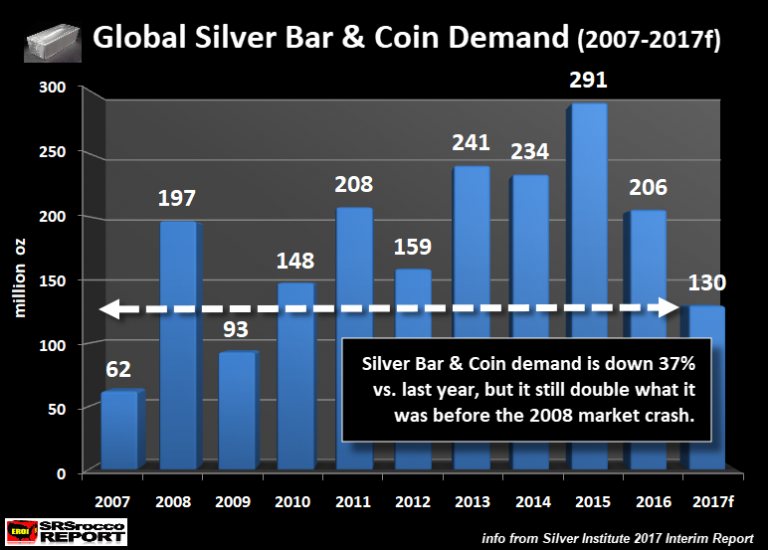 Investors frustrated by a silver market plagued with lousy sentiment and weak demand, may not realize that coin and silver bar investment demand is projected to be double what it was in 2007. Thus, long-term precious metals investors continue to acquire silver on price dips while others may be selling out and placing their bets into the bubble stock market or cryptocurrencies. It’s not the larger precious metals investor who is worried about the short-term price, rather its the smaller investor. Furthermore, silver bar and coin demand in 2012 was only 29 Moz higher than the estimate for this year, but the price was nearly double at $30 an ounce. As we can see, precious metals investors continued to purchase record amounts of silver bar and coins in 2013, 2014 and 2015 with the hope that prices would eventually start to head higher. However, the majority of the market’s funds since 2012 flowed into STOCKS, BONDS, and REAL ESTATE. Then after the election of President Trump to the Whitehouse, along with falling precious metals sentiment, investors pulled back on gold and silver investment purchases. From what I have heard through the grapevine, precious metals dealer sales this year are down about 40% across the board. And of course, the massive price increase in Bitcoin and the cryptocurrencies starting in March of this year funneled money away from the metals. With the new rush of investors into the Bitcoin market mania, several alternative media analysts have given up on precious metals and are now touting cryptocurrencies as the best place to be. In fact, some have stated that gold is no longer useful as a monetary instrument because cryptos will take over this role. Unfortunately, these analysts, just like our mainstream media counterparts, have simply forgotten about the terrible ENERGY PREDICAMENT we are facing. It’s almost as if the lure of $100,000 Bitcoin has totally destroyed their ability to understand that fundamentals still matter…. especially the Falling EROI – Energy Returned On Investment. Yes, it’s nice to have been one of the fortunate individuals who purchased Bitcoin back when it was $100 (or even less). But, as I stated, the world is still facing a severe energy predicament that Bitcoin or the cryptos can’t solve. When I listen to interviews where analysts say we are moving into a new high-tech world, I wonder where on earth they think we are going to get the energy to run all this stuff. Even though I enjoy watching Sci-Fi movies, it’s totally unrealistic to build spaceships that can be a mile long. The very day after the spaceship is built, all its components and parts start to break down. The more complex the parts, the faster they breakdown. People need to realize that technology won’t solve our energy predicament, it only makes it worse. Thus, the more complex the technology, the more energy it consumes. So, when someone thinks that, “technology will solve our problems,” then they must also believe in the ENERGY TOOTH FAIRY… a term coined by Louis Arnoux. I bring up these points because precious metals will still be one the best stores of value in the future as global oil production peaks and declines. We also must remember, the world runs on liquid fuels, not electricity. Even though we see more electric vehicles on the road, they can’t be manufactured without the burning of COAL, NATURAL GAS or OIL. Hence, renewable energy sources such as wind, solar and electric cars are nothing more than fossil fuel derivatives. As we can see in the chart, world silver mine supply peaked in 2015 at 894 Moz and will decrease by 24 Moz in 2017. 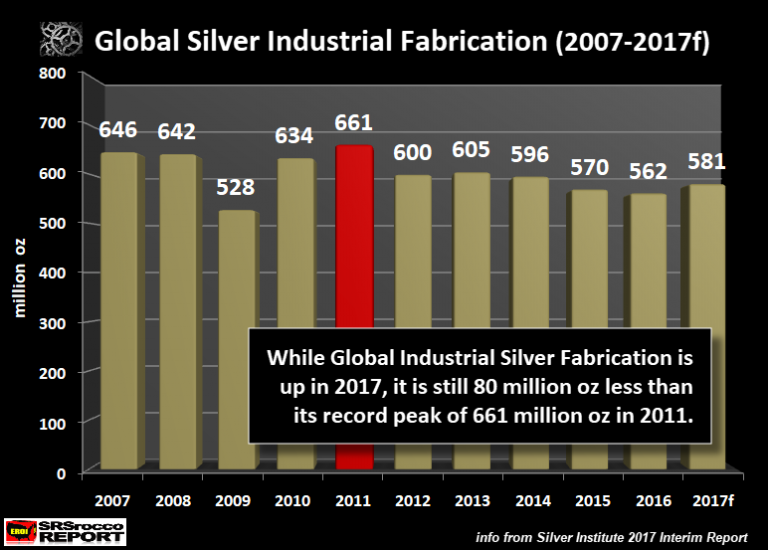 However, I believe actual global silver production will be less when all the data comes in. 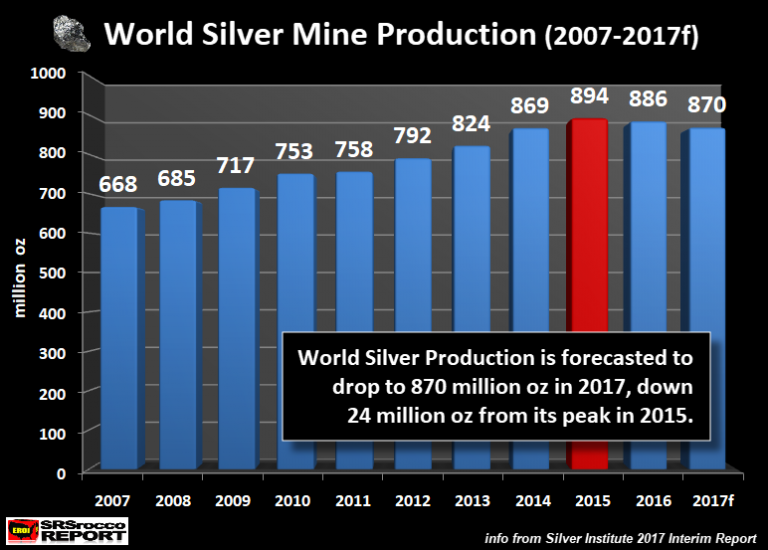 Regardless, once the U.S. and worldwide markets finally crack, world silver production will fall even faster. This will be due to the drop in demand for base metals where 58% of global silver production originates (35% byproduct of zinc-lead production and 23% byproduct of copper production). The majority of the rise in world silver fabrication was due to higher usage in solar PV manufacture and electronics. Even though the global demand for silver by the solar industry will continue to increase over the next few years, it won’t be the driving force in determining the silver price in the future. Instead, the collapse in the value of STOCKS, BONDS, and REAL ESTATE, due to the disintegrating oil industry, will be the factor that forces investors to protect their wealth in gold and silver.